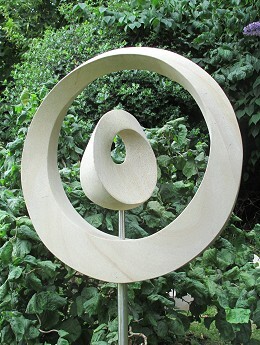 Möbius IV - 2013 - [sold] - A unique geometric sculpture, hand-made from beautiful fine-grained sandstone quarried at Glossop in Derbyshire. 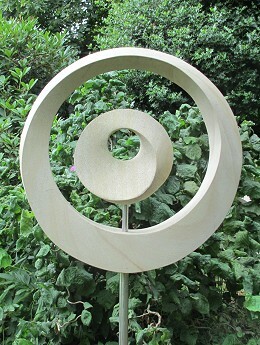 A twisted torus with a 23" diameter and a maximum thickness of 4". The inner torus, with a triangular cross-section, has a diameter of 10" and a maximum thickness of 5". They are supported by 25 & 16mm stainless steel rods from a hidden concrete foundation. The mathematician August Ferdinand Möbius first examined this strange form in the nineteenth century and gave us the Möbius strip. 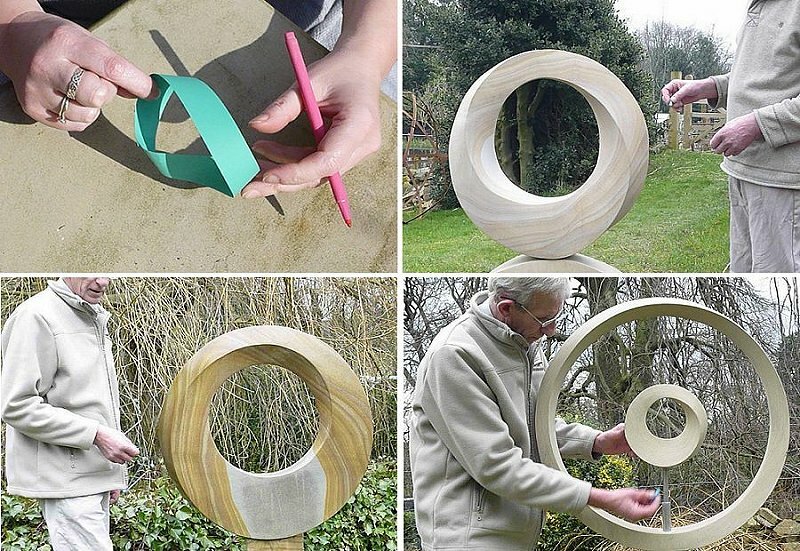 Take a strip of paper, twist it through 180°, turn it round into a torus and glue it together. Were you to trace a line along the middle of the strip, you would find that this strip of paper, which appears to have two surfaces, has in fact got only one continuous surface. Similarly, the Möbius strip has only one edge, not two as one might suppose. The cross-section of Möbius IV’s torus is a parallelogram throughout, but instead of having four continuous surfaces and edges as one might expect, it has only one of each. Twisting and warping the surfaces seems to transform stone from an inert material almost into an organic form. The cross-section of the torus gradually transforms from a square at the bottom to a perfect horizontal diamond at the top. These are such simple transformations to make – but ones which surprise the eye and the touch. 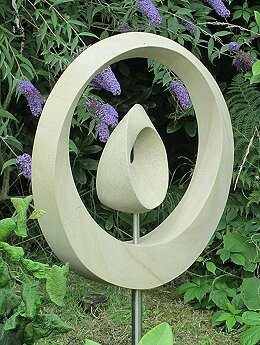 We are brought up in a built environment where stone surfaces are usually flat and their edges are usually square – these sculptures with their changing edge angles and warped surfaces challenge our subconscious preconceptions about stone forms by using a different logic of geometric construction.